Restaurants are bustling, high-trafficked areas that require regular cleaning and other maintenance to ensure the safety of patrons. When restaurant owners, management, and staff fail to take proper precautions, serious slip-and-fall accidents and injuries can occur. 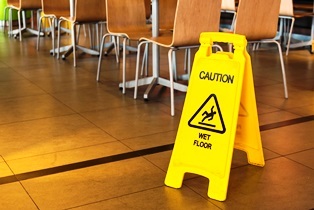 If you were hurt in a slip-and-fall incident at a Georgia restaurant, you may be entitled to compensation if you can prove your injuries were the direct result of a business's negligence. Restaurant owners or managers who knew about potentially dangerous conditions but failed to take action to correct issues or adequately warn patrons may be liable for resulting accidents and injuries. Though entertainment often portrays slip-and-fall accidents as relatively minor, these incidents can lead to significant health conditions, such as broken bones, concussions, traumatic brain injuries (TBIs), spinal cord injuries, paralysis, and other concerns. Collect evidence. Take photos at the scene of the accident, paying particular care to show where exactly the fall occurred and any obvious causes, such as wet or uneven flooring. Write down the contact information of anyone who may have witnessed the fall. Report the fall. Tell the restaurant owner, manager, or a staff member that you fell, but avoid going into detail about your injuries or what you were doing at the time of the incident. Seek medical attention. It's essential to be seen by a doctor right away after a slip-and-fall accident, even if you don't feel seriously hurt. Post-fall adrenaline can mask injuries, and some fall-related maladies may not be readily apparent. For these and other reasons, it's essential to document the accident and your injuries with a physician. After a slip-and-fall, restaurants and their insurers will work hard to minimize obligations to the victim. At Van Sant Law, our premises liability attorneys help you fight for the financial recovery you deserve, including compensation for medical expenses, lost wages, loss of earning potential, pain and suffering, and other damages. Do you have questions about your case? Contact Van Sant Law today to schedule an appointment for a free initial consultation.